Gowalkot/Govindgad fort is situated on a hill on the banks of Vashishthi river in Chiplun. The fort is well protected by the river from three sides and a trench was been built on the fourth side which is now in ruins. 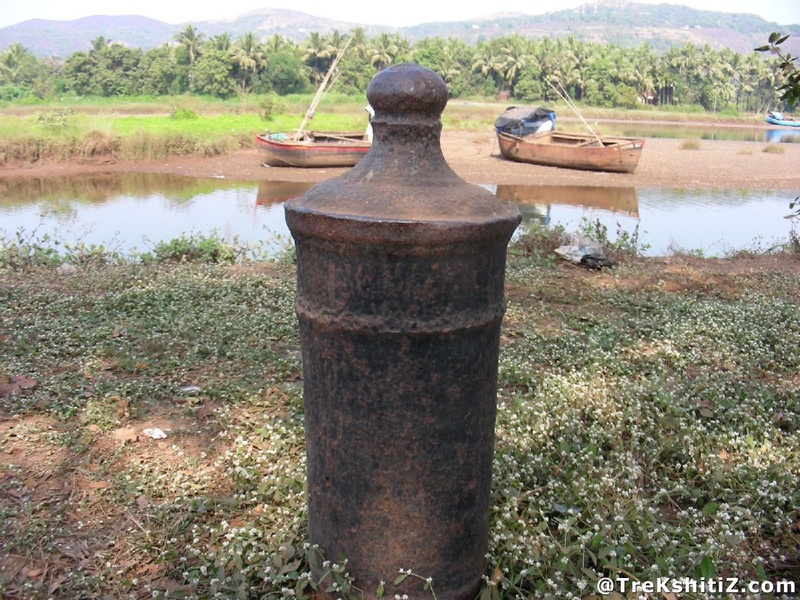 the main aim to build this fort was to protect the port of Chiplun. In 1660 AD, Shivaji Maharaj won the forts of Anjanvel and Gowalkot and renamed them as Gopalgad and Govindgad respectively. Sambhaji Maharaj lost Gowalkot fort to Siddi. On 20th March 1736, Pilaji Jadhav, Chimaji Appa and their army attacked Siddi Saat. Siddai Saat died in this battle along with his 1300 men and 800 Marathas. A pact was made in which Siddi retained Gowalkot fort with him. After 1745 AD, Tulaji Angre won this fort. There is beautiful temple of Goddess Karanjeshwar at the foothills. Steps behind this temple lead us to the fort. The main entrance of the fort is in ruins but the two bastions adjoining it are still intact. While trailing further from the right bastion, one can see two canons, remains of houses to the left, Vashishthi river to the right and Konkan railway, vast fields, Parshuram mountain beyond that. Moving further, there is a built water pond but has no water in it. Behind this pond there is an elevated structure from where one can see the entire fort. The fort wall is 8 feet wide and is still intact. There are many steps built at intervals to climb the fortified wall. There is a temple of Goddess Redjai on the fort. While descending from the main doorway, instead of taking the steps proceed towards the Chiplun Water filtration center where one can see remnants of the fort wall. Behind this water filtration center there is a bastion. Another dilapidated doorway which is on the west side of the fort takes us to Gowalkot jetty where there are 5 canons buried upside down.